Aleksandr Konarev was born in 1956 in Petropavlovsk-Kamchatsky. He graduated from the Russian State University for the Humanities in 1992. He has been the founder, publisher and Editor-in-Chief of the journal “Stomatologiya dlya vsekh / International Dental Review” since 1997. Aleksandr Konarev has been also the Editor-in-Chief of the newspaper “Vestnik MGMSU” from 2002 to present. It is the main newspaper of Moscow State University of Medicine and Dentistry – the leading medical educational institution in the country. 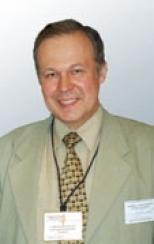 A. Konarev is the Head of the Editorial Department of Moscow State University of Medicine and Dentistry, the Member of the Editorial Board of the journal “Ortodontiya”, representative of the journal “ Stomatology for all / International Dental Review Magazine” in non-profit international scientific organization POSEIDO (the Periodontology, Oral Surgery, Estetic and Implant Dentistry Organization).